We needed a little break. Nashville is a place we've been wanting to take the kids for quite some time. Daddy had work to do there, and we were able to hitch a ride. Inside the Gaylord Opryland Hotel. 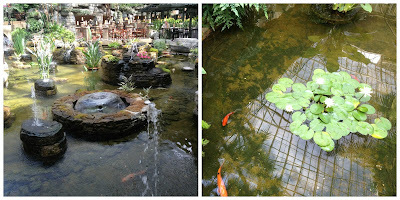 There are lots of beautiful plants, fish and ducks inside the hotel. You can even take a boat ride inside this huge place. In the adjoining mall, we had a unique meal at the Aquarium Restaurant. Jonathan was in heaven. 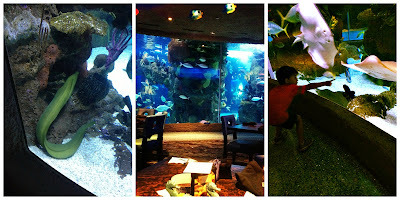 He loved the ocean creatures - especially the shovel nose guitar fish. I caught his amazement in the picture below at the moment he discovered the guitar fish had tiny little teeth. Next time we are in Nashville, I am going to schedule a behind the scenes tour with their marine biologist. 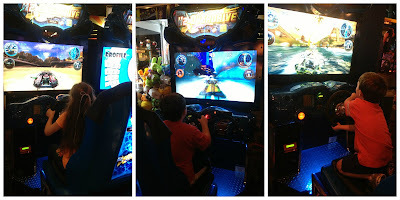 Our next stop was Dave & Busters for a little bit of silly fun! 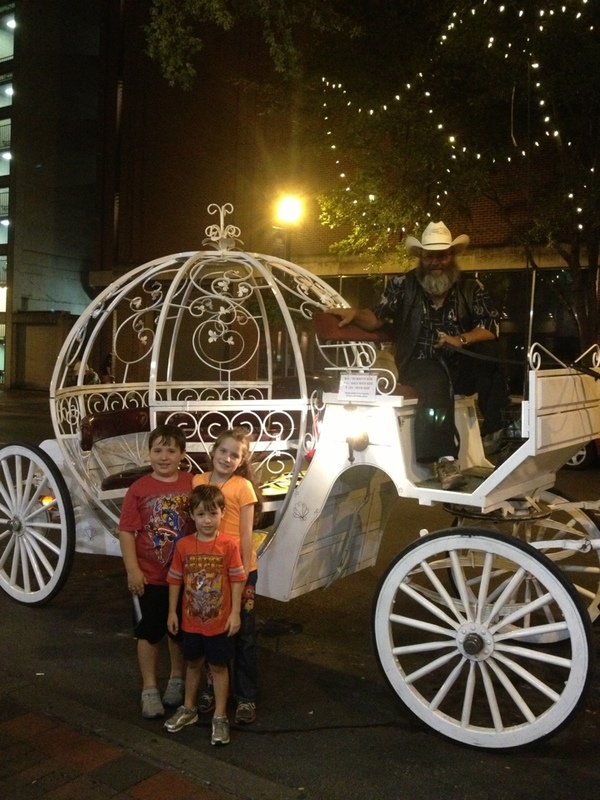 And our night ended with a carriage ride in Downtown Nashville. Our guide, Kenny, is a history buff and he shared a lot of his knowledge with us. It was a nice little stroll through downtown and around the State Capital. 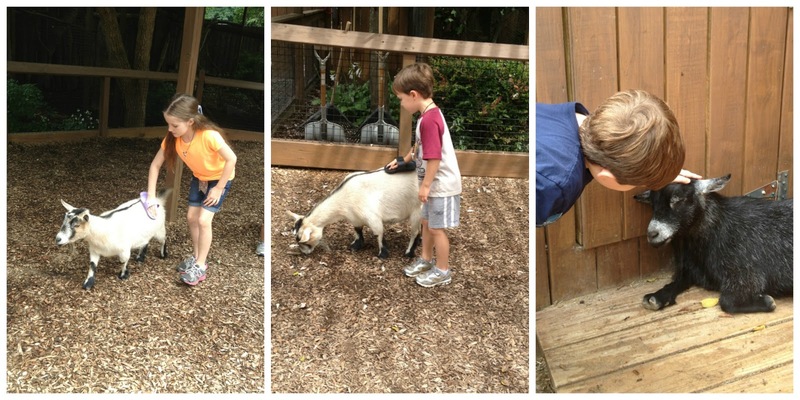 The kids swam in the indoor pool for a couple of hours and then we set out for the Nashville Zoo. After about an hour, the sun appeared and there was no more rain! 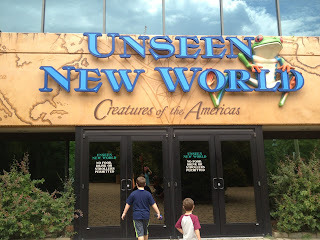 Unseen New World: Creatures of the Americas was by far the favorite exhibit for everyone! The bats, the caimans, the snakes, poison frogs, fish and sea horses were huge hits. We walked the whole exhibit three times! - Wonderful geography lesson as we looked for each animal's native home on the maps in front of the individual exhibits. The kids spent forty-five minutes playing with the goats. The hay was really messing with my allergies, so I stepped outside the fence and just watched my kids lovingly enjoy the other little kids. We explored for three hours and only saw 2/3 of the zoo. We were hungry and tired so we called it a day. On the way out, Jonathan spotted a skink running along the pathway and had a total meltdown when 1. He couldn't catch it and 2. I told him he wasn't allowed to catch anything inside a zoo! We found the nearest Chick-fil-a drive through, filled our bellies and then noticed we were only a mile from President Andrew Jackson's home. I asked the kids if they were up for one more adventure and they said sure - as long as it was outside and they could run free a little. 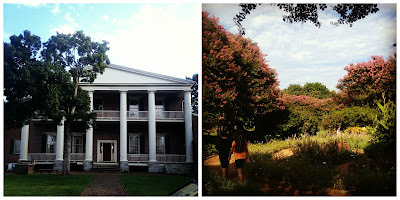 So, we made our way to The Hermitage. 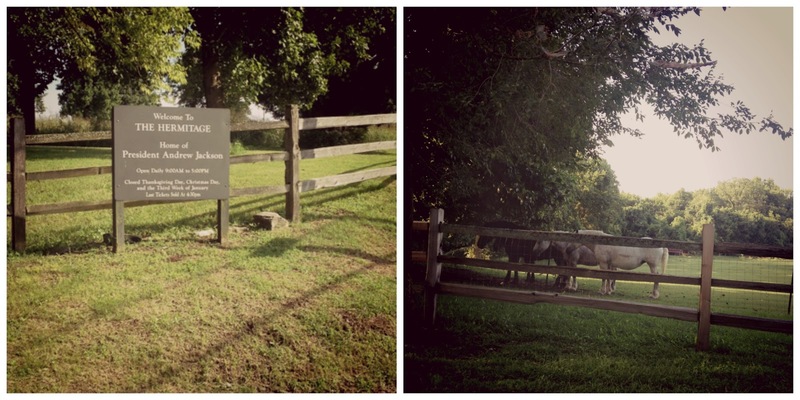 They ran the paths leading to the home and a explored Rachel's beautiful garden. We got there only an hour before closing. So we didn't have a lot of time to explore the premises. We did however take a quick tour inside the home. I warned the docents that I had tired children. They were fabulous at keeping their attention and filling us with lots of interesting and fun facts. I just hate we didn't get to explore the entire premises. Even if they'd stayed open longer it wouldn't have mattered. We were pooped! It is definitely on our must do again list! 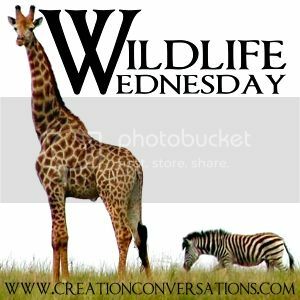 Oh, and as we were walking back along the path we saw a buck with velvet antlers and a doe frolicking through the meadow. It was so sweet! That night, the kids went down to the pool and swam for three hours - until the pool closed. (I don't know where they found the extra energy.) They met two new friends from the UK. All five had the most fun swimming together and playing games! Addresses and sweet hugs were exchanged at the end of the night. They are looking forward to being pen pals and Skyping, too. 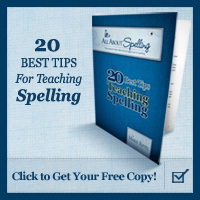 In fact, Caraline has already written their first letter. We just need to take it to the post office! 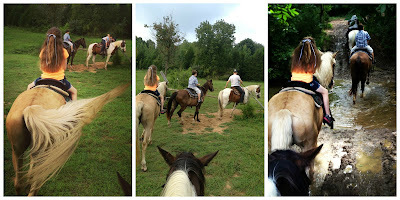 We rode horses at a stable just outside of Nashville. Our guide, Casey, was fabulous ~even though our ride was postponed an hour due to thunder and was cut short by thirty minutes because of another booking. The owners called during our ride to make sure Casey would be back at the barn on time for the next group. The owners didn't come out to offer us a discount for our shortened ride, but we still gave Casey a nice tip. He let us trot. So, I can't really complain too much. We made it home in time for me to jump into another vehicle and meet everyone for dinner at one of our favorite restaurants. We ran into a super special friend to our family that we don't get to see often. And, immediately after eating I left for an Awana leader meeting. The boys were having a few problems - I'll call it focusing - our first morning back to our regular studies. That's when I am intentional about praying together and then dragging out the Lego, building blocks and puzzles while taking some time to just read aloud. After our decompressing time, Ryan asked to read from our Swimming Creatures of the Fifth Day, Apologia Science book and to color a picture of a sea turtle and shark. If my kids ever ask to learn about something specific, I do my best to never turn them down. 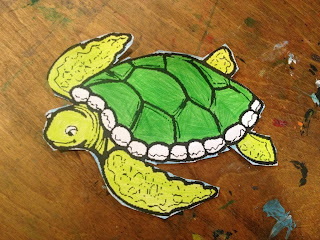 One of Ryan's coloring pages. He cut it out, too. Then Daddy helped with an experiment. They tested the temperature in the shade and in full sun and compared the two. And related those findings to cold blooded creatures. 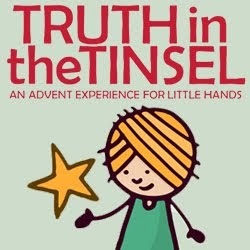 Caraline had piano lessons today since we missed our regular piano lesson day because of our trip. She LOVES piano lessons! Ryan has his second drum lesson tomorrow. I hope he continues to enjoy his lessons, too. I talked to my old Gracie Jiu-Jitsu instructor and signed the kids up for classes! They begin next week. Awana starts next week and co-op starts two weeks after that. Our afternoons/evenings are about to become much busier. 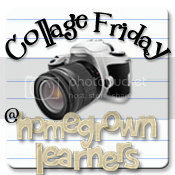 We are linking our Weekly Highlights with our friends at Homegrown Learners' Collage Friday and Weird, Unsocialized Homeschoolers' Weekly Wrap-Up. So thankful for such awesome neighbors and that sandy is safe! Looks like a fabulous trip! I have never been but on my bucket list! Have a great school year! I understand the busy afternoon and evenings, Hope. Your trip to Nashville sounds GREAT!! I am very jealous. Now that Anna is in Challenge A it is harder for us to just drop everything and go -- I'm glad we did it while she was little. Yay for piano! ;-) Miss Kim loves C, I know -- and I miss her! She misses you too - we all do. I am so glad your school year is going so well for you guys. You live in a fabulous area! 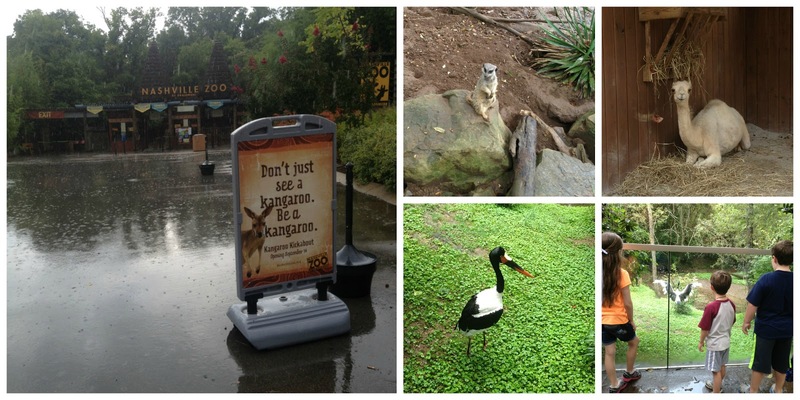 We really enjoyed our time there =) I think the kangaroo exhibit will be open next month. I'd love to hear what you think! Great review of your trip to Nashville! Thanks for the tips! That might have to be an upcoming trip for us. 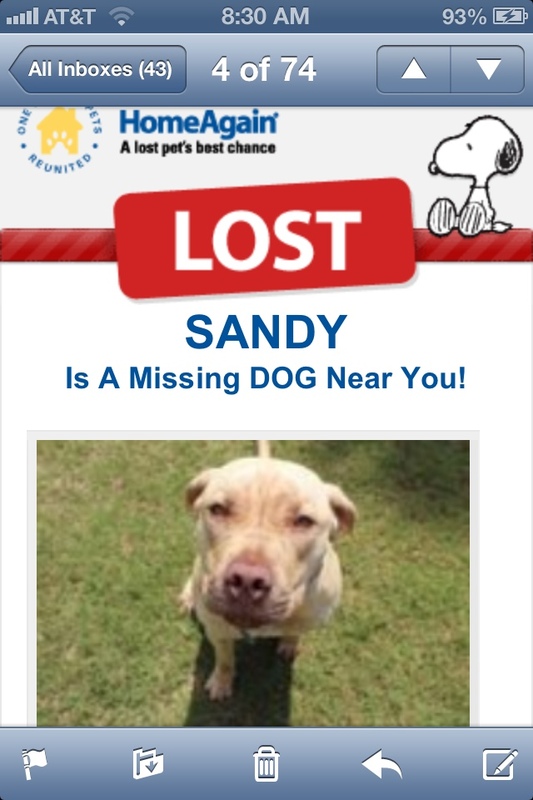 Glad the pups are home safe and sound! I'd never seen one like that before. It was a little hard to see out of, but it was totally fun! what a fun full week! 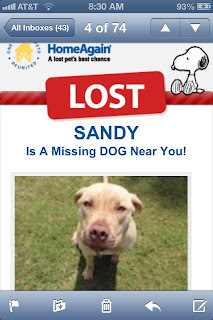 So glad your dog was found safe!! Thank you! It was heart wrenching for sure! Our Co-op started this week and our lessons in September and then we too will be much busier. Enjoy your slow schedule while it lasts.